Believe it or not, the ridiculously colorful, super splashy, topsy-turvy restaurant you see pictured above is a McDonald's. That's right, a McDonald's. 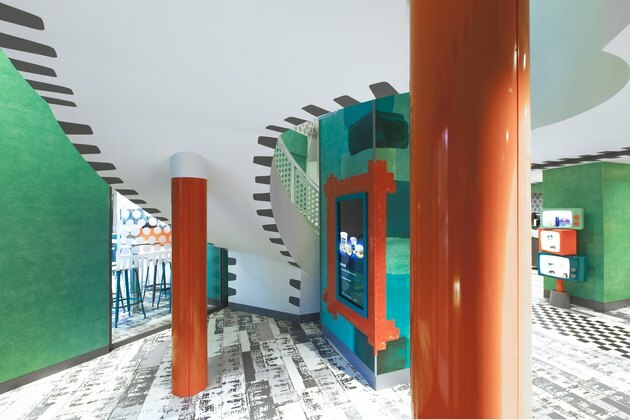 The new aesthetic, which features bright hues and punchy patterns, is spreading across the fast food chain's locations in France — there are actually seven of these in existence so far, including one in Paris's fifth arrondissement. They're the work of Italian designer Paola Navone, who was approached by McDonald's a few years ago. "When McDonald's first contacted me I was a little surprised. Curious as always, I met with the team. And this was another surprise: we immediately liked each other!" Navone said in a press release. "Their ability to listen, to understand, was essential. They have been eager, throughout this project, to find solutions in a universe with significant constraints." 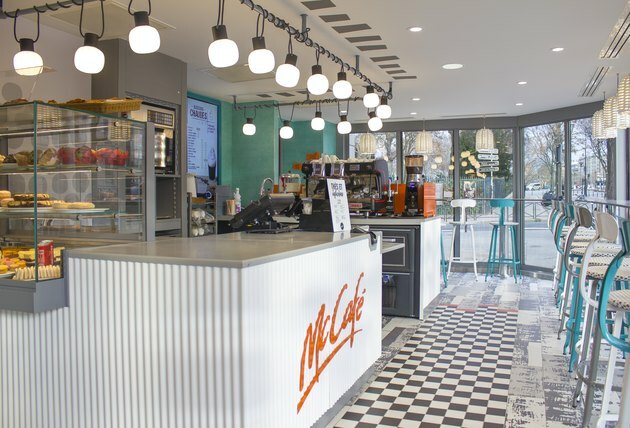 To many Americans, the idea of a design-forward McDonald's that looks like it could be the on-site restaurant of a quirky boutique hotel might not compute. But internationally, the brand has quite a different reputation than it does in the States. When I was in Nantes, France, for instance, I popped into a McDonald's for a soda (it was 95 degrees out and I desperately needed a caffeine pick-me-up). I was shocked to find that it had a beautiful sidewalk patio where dozens of diners were people-watching as they nibbled on fries. Instead of being known as a sometimes-grimy fast-food joint that you visit after a night out, McDonald's restaurants in France are actually seen more as reputable thanks to higher standards for production of food and meats. So, will we start to see U.S. chains get high-design makeovers? 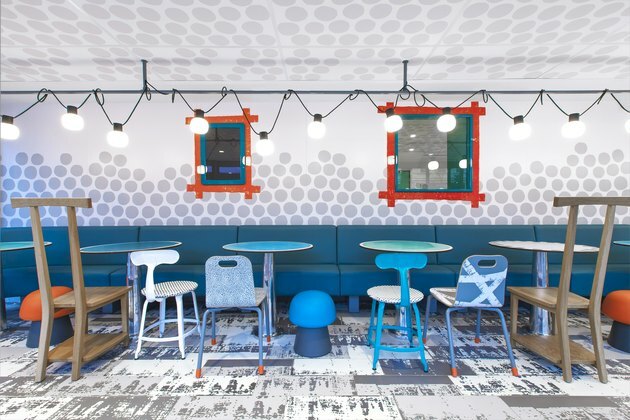 True, over the years, we've seen interior design updates to some fast-food chains. "Restaurants from McDonald's to KFC to Starbucks are rethinking their spaces inside and out, in a wave of design interventions that, given the sheer number of these restaurants, will spread throughout the U.S.," Nate Berg wrote for Curbed. "These redesigns are a product of the times. Fast-food brands are reacting to changing demographics, but they're also trying to stay competitive with the growing numbers of 'fast-casual' restaurants, like Panera Bread and Chipotle, that are luring customers away from deep fryers and greasy burgers with healthier dining options." Yet, as far as we can see, none of those design updates have been this, um, pronounced? 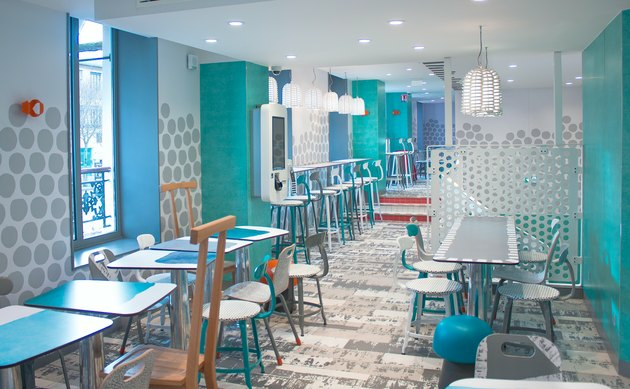 Even if "chic" McDonald's restaurants become a thing in the U.S., we're not so sure an American audience can palate both a Big Mac and Navone's vivid designs. But would we take a nice minimalist upgrade to our outposts? We'll raise our Shamrock Shakes to that. Stefanie is a New York–based writer and editor. She has served on the editorial staffs of Architectural Digest, ARTnews, and Oyster.com, a TripAdvisor company, before setting out on her own as a freelancer. Her beats include architecture, design, art, travel, science, and history, and her words have appeared in Architectural Digest, Condé Nast Traveler, Popular Science, Mental Floss, Galerie, Jetsetter, and History.com, among others. In another life, she'd be a real estate broker since she loves searching for apartments and homes. Is Pottery Barn's New Apartment Collection a Sign of the Times?